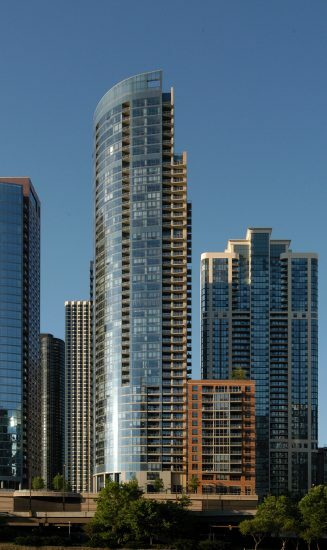 The Regatta is the second condominium tower that was completed in Lakeshore East. Rising 44 stories, the building contains 325 luxury condominium units. In 2008, the building received the Society of American Registered Architects (SARA) Award. The Regatta’s dual elliptical glass curtain walls dramatically encircle the building, reflecting the surrounding blues of the Chicago River and Lake Michigan. These elegant surroundings are matched only by The Regatta’s array of Shore Club amenities which include an indoor swimming pool, rooftop garden and theater room.